This was my second year attending the Digestive Disease Week conference, where doctors, reps from hospitals and pharmaceutical companies, patient advocates and others get together to cover all digestive diseases. At DDW you hear and see the latest news on everything IBD related, along with other diseases. Here are some of the pros and cons that I took away this year. It's official: The future is here. One of the coolest things I saw at the conference was a new pill-cam that will be coming out in the near future. There will be a day when endoscopies, colonoscopies and more will be seen as archaic. Doctors today can already order a pill-cam, which a patient swallows and which flashes a tiny light and takes pictures while passing through the digestive system. Soon the pills will not only be smaller, but the flashing light will be brighter. In addition, "the pack" the patient currently wears to capture the images will be smaller, too. (Today, patients wear a large vest or belt for most of the day.) There will also be a screen on which the patient can actually watch the pill go through his or her system, with a WiFi option which will allow for viewing the captured images in real time on a phone or tablet. I'm not sure if I could or would watch that for an entire day, but simply having the option will be very cool. At DDW I was able to speak with contacts at most of the major pharmaceutical companies. I wish I could share all the details, but much of the news is embargoed. That said, many of the medications on the market today work like a nuclear bomb: while they help a patient’s IBD, they also affect the rest of the body. These side effects understandably frighten some patients, leading them to avoid proper management of their IBD. In coming years, medications will be more like smart bombs than H-bombs, targeting precise areas of the body. This will lead to fewer side effects and more patients getting the treatment they need. Quality of care has always been an issue for IBD patients. Treating Crohn’s disease and ulcerative colitis can be more of an art than a science. Many patients need to try a variety of medications, surgeries, and more in order to find something that works. Many patients also have trouble communicating with their doctors about their IBD, while a lot doctors have trouble communicating with other doctors about best practices. 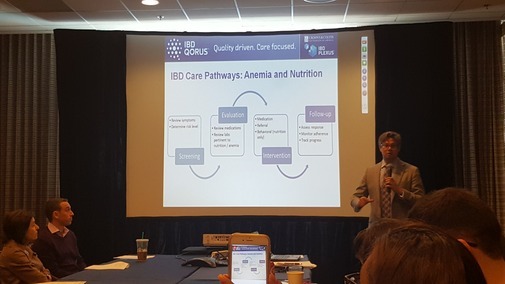 A new program that the Crohn’s & Colitis Foundation of America will be rolling out at major IBD centers is called Qorus, and it will change the way patients communicate with doctors, change the way doctors communicate with each other, and improve the quality of care for patients with IBD. The program will allow the patient to fill out a short form which will automatically be sent to his or her doctors in order to share what has been going on. On top of that, data will be shared anonymously, in order to provide better treatments and care for patients. Learn more about IBD Qorus here. Honestly, there weren’t many cons at the conference. But there was one that stood out -- one that, as a community, we need to continue to work on. While sitting at one of the larger sessions at the conference, some of the best doctors in the world were talking about Crohn’s disease and ulcerative colitis. While much of their information was enlightening, many evidently still think of some current treatments as a cure. For some patients, the removal of the colon can lead to an improved quality of life. But it’s still hard to believe that having a major surgery, which changes the way the body works and removes a major organ, is a cure. Many ulcerative colitis patients have countless problems after having their colon removed and either a J-Pouch or stoma created. A cure should be something that works for all patients, one that doesn’t change the way the body works and doesn't require the patient to adjust to an entirely new lifestyle. Clearly, there is still work to be done. Right now there is no cure for ulcerative colitis, and the word should not be used until a real cure has arrived. Overall, the experience at this year’s Digestive Disease Week was incredible. There are a lot of advancements coming, not only in technologies but in techniques and treatments. We should all have hope, knowing that the future will provide help to all of us on the IBD community.